Remember how much fun it was to charge your mobile with the pedal power mobile charger? Human scale tech or what we ordinarily call human powered machines have been around for a while but the real deal would be for this technology to move from the odd mall or airport corner or your science room to becoming a viable mainstream alternative to fossil fuel energy. 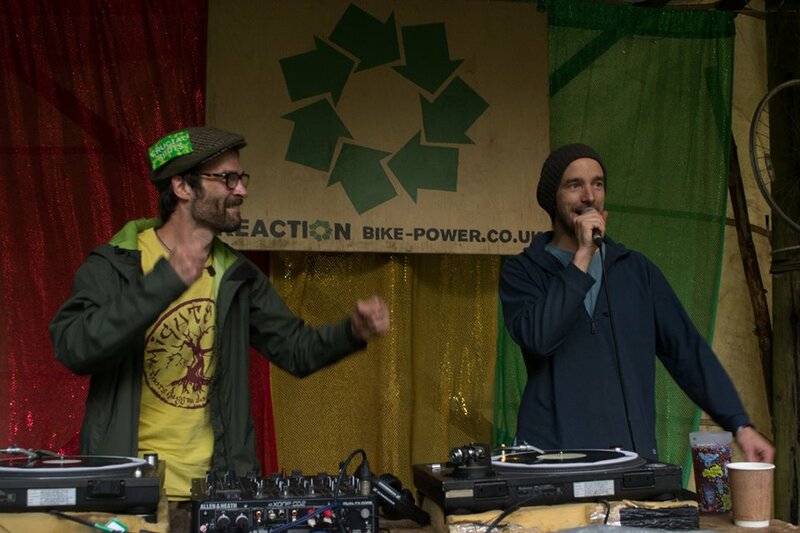 And that is what Tom of Reaction Sound System has been doing- making pedal powered sound systems for big music events and festivals so you can have some great eco-friendly fun! Wait did we just say eco-friendly and fun in the same sentence?! We’re greenies. We’re not “alt” anything. We enjoy work, fun, family & friends like regular urbans. So why should we keep thinking green living and green practices come in the way of fun? 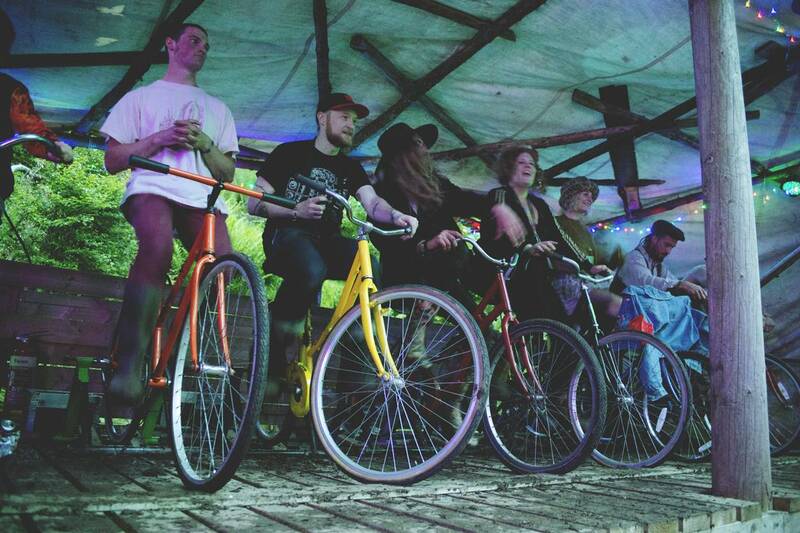 Our feature today talks about Tom and his pedal power sound systems that give all of us party goers and music fest lovers the clean, renewable energy alternative to partying furiously! Presenting Tom and the Reaction Sound System journey. One thing we believe in very strongly- there are always solutions if you are willing to look. In 2007, Tom had been working on a loudspeaker design to use with small batteries for playing music while promoting “Grassroots” events. Grassroots was an environmental fund-raising event he had set up with friends, giving small grants and funds to local and international environmental projects and charities. Realising how little power was required to make a good level of sound when using the right speakers, Tom was looking for a way to create the energy required whatever the weather and for as long as was needed. Fossil fuels were out of the question of course. But the solution was right there. Since the early days of electricity and before there have been hand and foot powered devices from military radios to corn stripping machines. All you need is pedal power from a bike. By 2009 Tom was touring festivals with a decent pedal powered sound system. At first doing most of the Djing and developing the skills to keep people involved using the microphone at this point it was a just fun drop in thing but soon everything had been rebuilt. Tom had learned loads from Martin Robinson at Purple Pro Audio in Leeds. Plus others, and redesigned the system to look something like how it looks now. Tom and Steady, continued to tour with the pedal powered sound system- Steady being our expert in band sound engineering (and also a very good tradesman!). Much was learned about live sound in these early years with loads of bands and guest DJs playing on the sound. Work began on a better way to show the cyclists and the audience what was happening with the electricity and when you had to pedal harder. This took a long time but eventually Tom had worked out how to create an LED bar graph which shows the power level of the system in a 20 segment display. The lead acid battery we used was replaced with capacitors which store and release energy much more quickly and efficiently, amplifiers and cabling were upgraded and more speakers were built. This was when it got serious as Peter (Jedi Pete) Tatham, Cam (High Lassie) Thomas, Emlyn (Dj Gremlyn) Hagen, Val (v-ital) Ragni, Naomi (no.me) H-B, joined Tom (reaction sound) Evans and Nick (Dj Treekle) Morgan to making a deadly Dj crew with the motto: Killing sounds in a post-fossil-fuel-apocalypse-style. 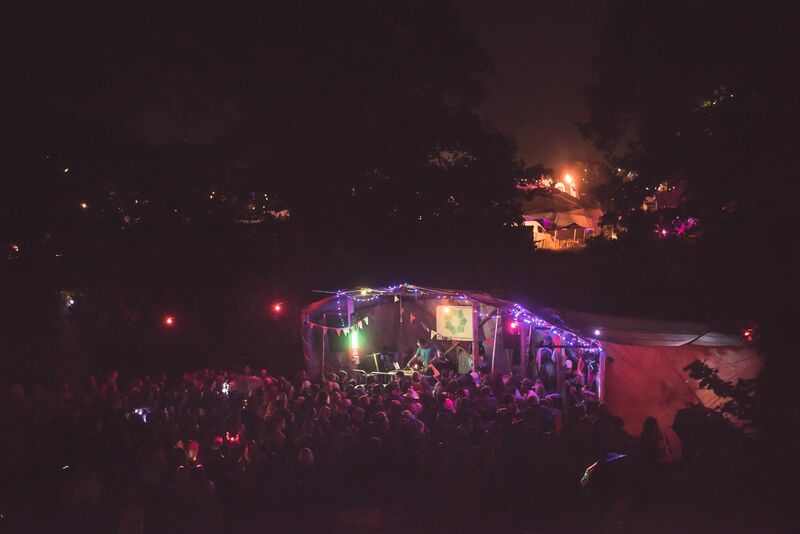 Sharing the workload during festivals and busy times, artist liaison and stage management, plus behind the decks adding their unique musical influence to the show. 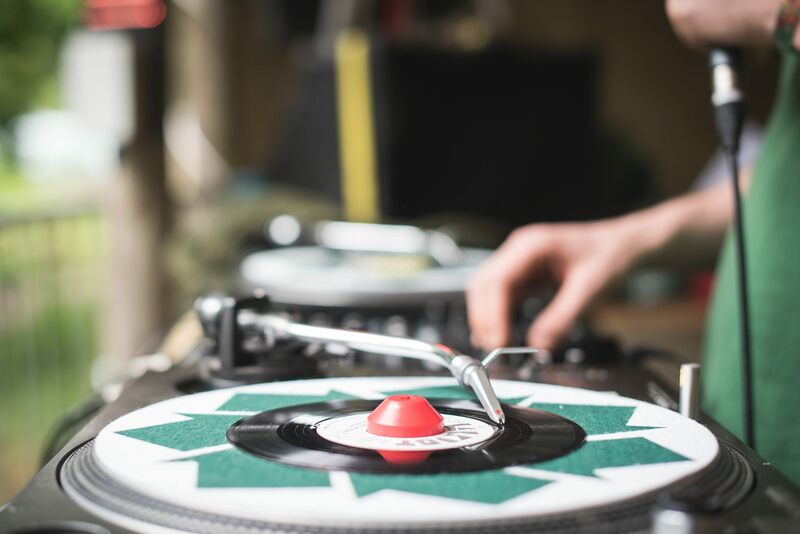 The crew and the system can be seen at the Boardwalk Reggae/ Dub arena in Eden Festival or at Northern Green Gathering, Equinox festival, Shambala and more. Originally called Chain Reaction Power Systems, they became un-chained in 2012 when Reaction Bike-Power was born. Reaction Sound System can work on the mains or solar power so they have separate accounts on social media for the soundsystem and the bike power. Reaction is still run by Tom who still builds all the equipment hosting, sound engineering and Djing at events. Tom’s vision is not just a sound system using pedal power but go beyond. They also do a cinema, car racing track, inflatables, schools educational demonstrations, energy awareness demos, pedal power competitions, and commissions. In the future Reaction plan to build more and bigger loudspeakers and are working on a fourth generation of bike generator. Their vision is an up-sized and improved system for large stages and so they will keep working to make it as good as it can possibly be, adding more power monitoring and more interactive elements as they grow. Sure its a far off way to powering Tomorrow land with bikes but with tech advancement the zeal of Tom and his team, it’s not mission impossible! Green fingers crossed! And in the meantime here some more from UrbanMeisters archive on green energy practices and products. To get you started, we shared practical and handy tips on energy saving by UrbanMeister Gareth as well as an easy to understand infographic explaining the benefits of solar power. We have also presented smart devices like Luko and Quilo that cut needless usage of energy and reduce wastage thus increasing your savings. Get started on green energy practices and consumption already!